Modex helps developers start building on top of the Ethereum Blockchain with everything they need in one single place. Coming Soon: Plug and play infrastructure to deploy and host your DApps. The Modex ecosystem helps developers, teams and businesses of all sizes get started on blockchain, providing the full set of tools needed to learn, create, test, deploy and sell smart contracts and DApps. Besides helping developers to get started with blockchain development, we offer them 3 avenues to monetise their skills. This text should shortly reinforce the above mentioned tools and explain in a few words that we are helping developers to start earning MODEX tokens. 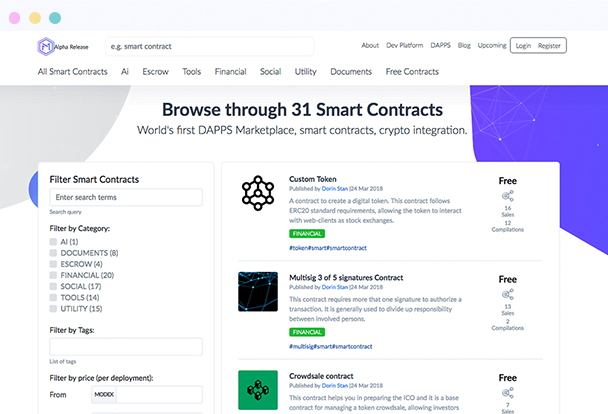 With a variety of smart contracts to choose from, written some by the best developers from all over the world, Modex Marketplace is the best place to find the software product you need. On top of this, depending on the company size and need, one may require a full fledged custom solution which can be solved by posting a bounty or by contracting our inhouse custom solutions development team. 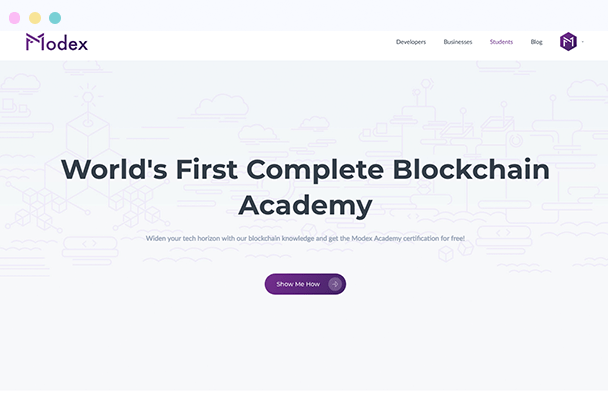 Widen your tech horizon with our blockchain knowledge and obtain Modex Academy certification for free! Curated by our experts, these courses will help you understand the foundation of blockchain technology and the opportunities it brings. Modex is the go-to-marketplace for developers looking to connect with clients in need of blockchain development and smart contracts.